With kids ages 2, 6 and 8, it’s sometimes tough to find games that everyone can play. 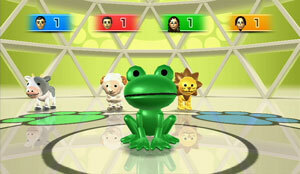 Wii Party will be one of them when it launches this Fall. Included in the title are more than 70 minigames broken down into three main categories: House Party, Pair and Party. My favorites fall into the House Party category, which literally takes games out of the TV and into your living room. For instance in Hide ‘n’ Hunt one player hides your all your Wii remotes and the other players find them. The remotes make animal noises every 15 seconds so players can find them more easily. Animal Tracker challenges players to figure out which remote is making a particular sound. 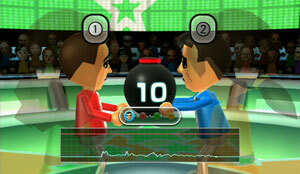 And Time Bomb is vaguely reminiscent of hot potato, where you have to pass the Wii Remote around as smoothly as possible or the “bomb” will go off. The remote becomes more sensitive as time goes on. I also like the Pair games, which require cooperative play. 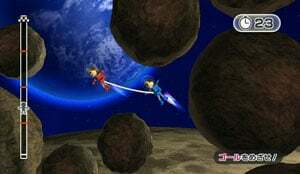 In one minigame I played, my partner and I had to use jetpacks to maneuver through an asteroid field. Since we were tethered together, a poorly timed boost could cause the other player to collide with an asteroid, slowing both players down. All of them require you to help and keep track of your other half. The Party games are more competitive with racing, shooting and board games. They’re fun but not unusual. Available this fall for $50.